One of the greatest blessings that Fate bestowed on me in 2013 was meeting Eric Millen. Eric collects great graphic artists, with all the passion that I once collected Mickey. And each artist he discovers, he celebrates with articles, interviews and videos on his Blog, “Massive Fantastic.” It began in February 2013, when I Googled myself to see if anything was happening with the Outer Space Men. That was the only way I could find out. And a link led me to Eric’s Blog. WOW! I discovered PART ONE of a two-part story about yours truly. When PART TWO appeared, I introduced myself to Eric. He asked if he could do an interview with me online, in which I would answer 10 QUESTIONS. Absolutely! Meanwhile Eric, and Kristina, his charming wife, (upper right) have become frequent visitors to Mouse Heaven. And they have, quite literally, changed my life. On his first visit, Eric made a 22 minute video. On subsequent visits, Eric made another, video. He calls this one a “Full Length Documentary!" The links to both of them are below. Eric and Kristina have also brought new friends into our life. They introduced us to the great painter, illustrator, and author, James Gurney, and his lovely wife and soul-mate, Jeanette. James is best known for his series of books about the fabled world of “Dinotopia” And I’d like to think that it was the collection that that inspired Jim to make a stop action movie, here in “Mouse Heaven,” which he renamed, “Melville” in the video. Bil Baird's puppet, "Miss Bubbles La Rue" had a starring role. "The Birnkrant Collection: A Guided Tour"
Clement spends Molly’s dime to see Miss Bubbles live. She soon kicks him aside. And he ends up in the dog house. Because Jim feared that Miss Bubble's poitrine was too titillating for You Tube, scene stealing post production pasties were applied. For the very FIRST MassiveFantastic.com Studio Visit I had the AMAZING opportunity to visit Mel at his museum/home and discuss his art, toy collection, friendships, and ideas about creating. Mel has one anamazing collections of vintage comic character art, images, and toys from 1900-1940! With his collection he has single handedly saved one of the greatest art movements never known, the beginnings of abstraction..
What makes Mel's website really compelling is that he brings an artist's eye to the presentation. He assembles the figures into groupings, beautifully lit and photographed, as if they're gathered to look out from their world into ours. 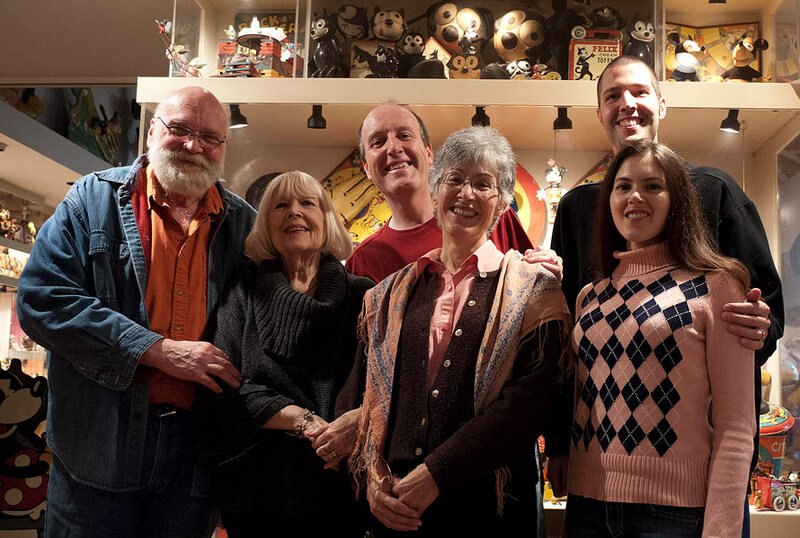 I'd like to introduce you to my friend Mel Birnkrant, who has one of the most amazing toy collections in the world, concentrating on comic characters from the 1920s and '30s. When I visited him a few days ago, he showed me a favorite, the Toonerville Trolley. 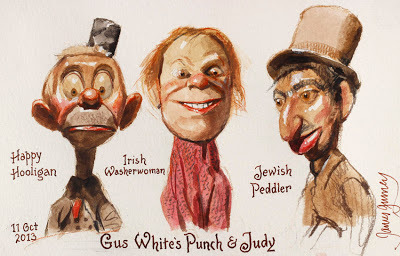 Gus White was a traveling puppet maker, ventriloquist, and portrait painter who brought a Punch and Judy show to small town America. Yesterday, using watercolor and colored pencils. I sketched some of Gus White's one-of-a-kind hand puppets. White carved the heads from wood, painted them, and applied real hair or wool. James Gurney paints the "Outer Space Men" action figures, invented by Mel Birnkrant in 1968.Media: gouache, water-soluble colored pencils, and white gel pen. I fell in love with these comic character puppets, so I wanted to paint them to better understand their design and construction. Collector, Mel BirnkrantHYPERLINK "http://melbirnkrant.com/collection/index.html" helped me set them up in front of the sketch easel, and he made them dance for us. If you've never heard of "The Weenies," that's because it's the toy and cartoon phenomenon that almost happened, but got cancelled before it fully rolled out. The concept was developed in 1983 by Mel Birnkrant, Mike Strouth, and Kiscom, and then purchased by Coleco to be the next big thing after Cabbage Patch Kids. Mel says, "Isn't it ironic that modern art had to fight so hard to introduce abstraction to the world? 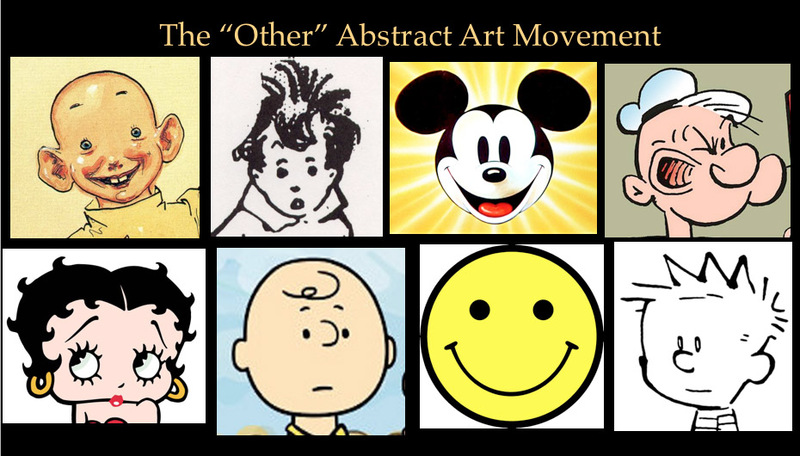 When all the while, abstract art had already been peacefully introduced and willingly accepted by an eager public, many years before, in the form of comic characters." I'm fascinated by the character design from a century ago. They have a sort of eager mania with their big eyes and effervescent smiles. Who can resist those cute Kewpies with their eyes coyly turned aside, and the bouyant little Brownies. Here's a short video that I made to spotlight the wonderful sand toys and music boxes created by Mel and Eunice Birnkrant. The figures are cut out of paperboard sheets and arranged in a tiny stage, complete with curtain and audience. Mel took the idea to the next step and invented the mechanisms needed to make them come to life. Last week I had the privilege to visit my friend Mel Birnkrant, who showed me his original prototypes for MAXx FX, an action figure who dons movie-monster prosthetics to become the Werewolf, Mummy, Jason, Freddy, Swamp Creature, and Caveman. 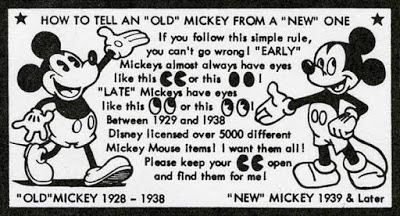 The Disney Company gladly dumped the classic Mickey Mouse, after Fred Moore redesigned him in the late 1930s. But toy collector Mel Birnkrant discovered Classic Mickey and made it his life work to rescue him. Toy collector Mel Birnkrant has many rare treasures. But one of the most ephemeral is a paper construction set called the "Fairy City." It presents a view of American city life 100 years ago. Mel carefully built it, and then we "unbuilt it" in time lapse and reversed the film, adding in a little stop-motion animation at the end just for fun. Eric created this video in March of 2014 when I was seventy-six years old. It captures a moment in time when both Mouse Heaven and I were in our prime. Now, in 2019, half a decade later, unlike yours truly, the collection still remains unchanged. This video was shot among a crowd of friends. If you look carefully, you might glimpse their fleeting shadows, reflected in a showcase. I offer thanks to everyone who participated in the filming, and also to James Gurney who supplied the opening sequence and the close-ups. My good friend Eric Millen shot this video a year ago. Although, it’s overlong by twice, it’s totally spontaneous. For better or for worse, nothing was set up, or planned ahead of time. Its random nature and captured moments of surprise are absolutely genuine. It's time to visit my friend Mel Birnkrant who almost singlehandedly rescued the early image of Mickey Mouse. One of Mel's cherished possessions is a set of one-of-a-kind sculpts of Minnie, Mickey, and Horace Horsecollar from about 1934. The rubber-hose style legs are made from electrical wire, and the heads are hand-carved from wood.